Panasonic’s ongoing effort to automate Japanese hospitals continued this month with the launch of the HOSPI-R, an autonomous delivery robot that is now on sale. 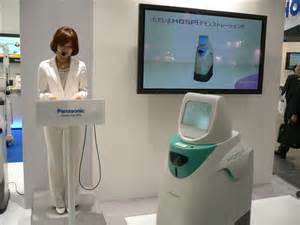 In its press release, Panasonic contends that robots like this one are needed to maintain and improve the quality of nursing services due to Japan’s rapidly aging society. The latest in the company’s line of HOSPI robots is designed to transport samples and drugs so that lab technicians and nurses won’t have to. The main benefit of the HOSPI-R is its autonomous navigation capabilities. Whereas many automation systems rely on obtrusive rail systems or other delineated routes, the HOSPI-R navigates using just its onboard sensors. When compared with conventional rail systems, Panasonic’s system implementation costs reduce to between 25 and 50 percent (and maintenance costs are reduced to 20 percent). As you might expect, the HOSPI-R also has some security features to prevent tampering, damage, and theft of the drugs and samples it is tasked with delivering. An automatically locking door on its storage container opens with ID cards, and liquids (such as chemical or urine samples) are kept in a stable position to limit foaming. The robot’s gradual acceleration and deceleration also helps to ensure a smooth trip from start to finish. The robot can carry up to 20 kg (44 lb), and moves at a maximum speed of 1 meter per second (2.2 mph). It can work up to seven hours before needing to be recharged, which takes about eight hours, so a team of robots on rotation can work 24 hours a day. Panasonic did not reveal specific pricing, as that will vary depending on the needs of each facility. Source: Science & Technology World by Author Liang Yuting .